While there is great potential for using stem cells in regenerative therapies, there is still a ways to go before it can be considered a proven practice, although recent breakthroughs, and one specific trial in particular, makes it seem much closer. Recently, the first human tissue-engineered organ using stem cells was created and transplanted successfully into a patient. Other tissue regeneration efforts with stem cells have also recently made many breakthroughs, emphasizing the potential of using stem cells in future tissue transplants. In the first reported instance of using stem cells to bioengineer a functional human organ, Paolo Macchiarini and his research group used a patient’s own stem cells to generate an airway, specifically a bronchus, and successfully grafted it into the patient to replace her damaged bronchus (See Figure 1). Macchiarini’s group bypassed the problem of immune rejection by using the patient’s own stem cells. Additionally, by combining a variety of bioengineering efforts, no synthetic parts were involved in the creation of the organ; it was made entirely of cadaveric and patient-derived tissues (Macchiarini et al., 2008; Hollander et al., 2009). Figure 1. 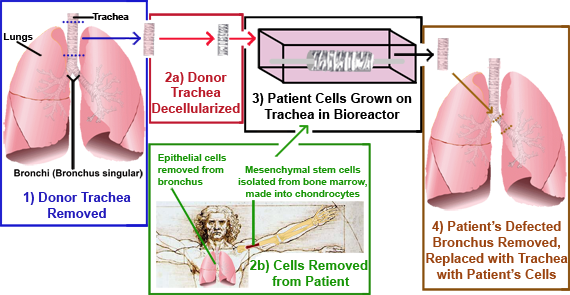 In order to create a patient-compatible replacement bronchus, Macchiarini’s group removed and decellularized a trachea from a cadaveric donor, grew cells removed from the patient on the trachea in a bioreactor, and then transplanted the bioengineered airway into the patient, successfully replacing their defective bronchus (Macchiarini et al., 2008). Human embryonic stem cells (hESCs) recently celebrated the 10th anniversary of their discovery, and in the decade since their isolation they have possibly received more press coverage, both over their many potential applications as well as ethical concerns, than any other type of stem cell. In the last decade, much progress has been made in better understanding these cells and their capabilities. hESCs hold much promise not only for being cellular models of human development and function, but also for use in the field of regenerative medicine. However, due to ethical and application concerns, only recently have these cells made it to clinical trials. Figure 1: The Blastocyst. Human embryonic stem cells are isolated from early-stage embryos in the late blastocyst stage, about four or five days after fertilization. The blastocyst is a hollow sphere made of approximately 150 cells and contains three distinct areas: the trophoblast, which is the surrounding outer layer that later becomes the placenta, the blastocoel, which is a fluid-filled cavity within the blastocyst, and the inner cell mass, also known as the embryoblast, which can become the embryo proper, or fetus, and is where hESCs are isolated from. Though human embryonic stem cells were isolated just over a decade ago, embryonic stem cells were successfully isolated from other animals before this. Nearly 30 years ago, two groups independently reported the isolation of mouse embryonic stem cells (mESCs) (Martin, 1981; Evans and Kaufman, 1981). The mESCs were isolated from early-stage mouse embryos, approximately four to six days post-fertilization (out of 21 days total for mouse gestation). At this point in development, the embryo is in the late blastocyst stage (see figure 1). It was not until the mid-1990s that this feat was accomplished with non-human primates by Dr. James Thomson’s group (Thomson et al., 1995). Only a few years later, embryonic stem cells isolated from humans, once again by Thomson’s group, in 1998 (Thomson et al., 1998). It is important to understand where hESCs come from in order to understand the ethical arguments that surround them, as well as their enormous, innate biological potential. Like mESCs, hESCs are isolated from early-stage embryos that are, specifically, in the late blastocyst stage, about four or five days after fertilization. After the fertilized egg cell starts cell division, what is referred to as the “blastocyst” occurs once the cell has divided into a hollow sphere made up of approximately 150 cells (see figure 1). At this point, the embryo has not even yet been implanted in the uterus. 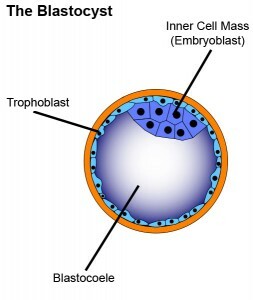 The blastocyst contains three distinct areas: the trophoblast, which is the surrounding outer layer that later becomes the placenta, the blastocoel, which is a fluid-filled cavity within the blastocyst, and the inner cell mass, also known as the embryoblast, which can become the embryo proper, or fetus. Embryonic stem cells can be created from cells taken from the inner cell mass (Stem Cell Basics: What are embryonic stem cells?, 2009). Because these cells are taken from such an early stage in development, they have the ability to become cells of any tissue type (except for the whole embryo itself), making them pluripotent. The pluripotency of hESCs is probably the trait that contributes most to their enormous potential, both as models of cell function and human development and, potentially, for uses in regenerative medicine. Being pluripotent and seemingly unlimited in supply separates hESCs from adult stem cells, which are multipotent or unipotent, able to become a more select group of cell types, and more limited in their cellular lifespan.